20. Battle on the Bay : The Civil War Struggle for Galveston by Ed Cotham. 19. A Severe and Bloody Fight: The Battle of Whitney's Lane and Military Occupation of White County, Arkansas, May and June 1862 by Scott Akridge and Emmett Powers. 14. Steele’s Retreat from Camden and the Battle of Jenkins' Ferry by Ed Bearss. 1. The list is not comprehensive in terms of being multi-disciplinary, it is just my personal opinion in line with my own study interests. Although I regularly read all types, I think from reading my blog you can pretty much determine what kinds of books I most like to read--i.e. detailed modern battle and campaign histories over social or political histories, biographies, diaries, memoirs, essay compilations, unit histories, etc. Judge the list for what it is, not for what it isn't. 2. If I haven't read it it won't be on the list. I won't go on reputation only no matter how lofty, so obviously this leaves out some very fine books. 3. The list will not be in any kind of order, so #1 will not necessarily be my favorite. Dimitri's posting today about the the work of photographer Matthew Brady, reminding me of an anecdote told by William Styple during the Booktv program a few weeks ago dealing with his book Generals in Bronze. If I recall the story correctly, the artist James E. Kelly was friends with Brady, who related an interesting story to him. A certain U.S. member of Congress proposed that the federal government purchase Brady's CW plate collection for $25,000. The motion passed but it was (politely?) demanded from Brady that he pay half the amount to the good, honest public servant who made the proposal in Congress. Anyone want to guess who this person was? The name was omitted from later interview draft notes, but Styple found the originals and the incorruptible personage was revealed there as none other than Benjamin Butler. Kentucky historian Randall Osborne helpfully pointed me toward another history journal that publishes online versions of its articles. Ohio Valley History, published by The Filson Historical Society, has the articles from the latest two issues available in pdt format for downloading. I found Hope and Humiliation: Humphrey Marshall, the Mountaineers, and the Confederacy’s Last Chance in Eastern Kentucky by Brian D. McKnight (Vol. 5 No. 3) to be interesting. "We take old texts, scan them, clean them up, create an index if the book warrants one. We then upload them to Lulu.com, a Print on Demand provider. When you select one of our titles, and make payment through Lulu’s secure server, a copy is printed, and mailed directly to you in a sturdy carton. The whole process takes about 10 days from order to receipt of your books. Each order is custom crafted at Lulu’s facilities in the United States." Among the others, a volume by Weaver dealing with the Kentucky State Guard caught my eye. I think I'll be checking back with this site frequently. Another good use of the Internet... With the permission of the Kansas State Historical Society, articles from Kansas Historical Quarterly (1931-1977) are being transcribed by volunteers for online posting. Many are available now for viewing. Not as many Civil War related articles (not even a Centennial uptick) compared with other quarterly state historical journals but worth a look nonetheless. I hope this becomes a trend. Sure, the articles are easy enough to obtain through ILL, but being able to look through them first online to separate the wheat from the chaff would save a lot of time and expense. I was corresponding with Missouri author, historian, and (of course) lawyer James McGhee the other day and we were both lamenting the lack of a book length study of the period surrounding the Battle of Lexington. Missouri State Guard General Sterling Price's successful advance to the pro-Southern "Little Dixie" region astride the Missouri River after the victory at Wilson's Creek is a neglected piece of Civil War military history. Price's capture of the large brigade-sized Federal force under Colonel James Mulligan at Lexington was an impressive victory for his large but poorly trained, supplied, and equipped army. The success resulted in recruits flocking to Price's standard and perhaps represented the high water mark of Southern hopes for the state. Although several short articles have been written, the best single source remains Michael Gillespie's short booklet The Civil War Battle of Lexington, Missouri. I purchased a copy from Camp Pope a few years ago but it looks like they don't sell it there anymore. The bookstore at the Battle of Lexington State Historic Site is probably the best bet for finding a copy. Three independent Confederate forces were in position to cooperate with Missouri State forces but proved unable or unwilling to help. Ben McCulloch, who hated Price, returned his division-sized force to Arkansas after Wilson's Creek. William Hardee's brigade-sized command in northeast Arkansas and Gideon Pillow's 6,000 man Army of Liberation at New Madrid, MO similarly declined to assist MSG General M. Jeff Thompson in the bootheel region of SE Missouri. This lack of pressure on multiple fronts allowed John C. Fremont the opportunity to concentrate against Sterling Price's guardsmen at Lexington. The large 38,000 man Union force easily herded Price back into the southwest corner of Missouri, permanently solidifying U.S. control over the state. Jim and I both agree that mid-summer 1861 was the South's last real opportunity to accomplish something important in Missouri. However, with no overall directing hand, the combined Confederate-Missouri State Guard victory at Wilson's Creek went largely unexploited. Although I doubt that any permanent Confederate stronghold in Missouri was possible, active Confederate armies operating in Missouri in the latter part of 1861 could have had a serious effect on Union plans for the Western theater in the first months of 1862, perhaps allowing A.S. Johnston's Confederates more time to prepare river defenses in Tennessee. In January of 1862, with only a weak enemy presence in Missouri, Union Department of the Missouri commander Henry Halleck had over 70000 men stationed in the state, leaving only around 20000 men with Grant east of the Mississippi. With a graver threat to Missouri, would Halleck have even authorized the Henry-Donelson thrust? Once this summer 1861 window of opportunity passed, all possibility of sustaining a strong Confederate presence in Missouri evaporated. The Missouri River ran east-west across the middle part of the state and the Federal army controlled the railroads, all of which exited Missouri only into Northern states. The fact that Missouri was hemmed in geographically by free states on three sides didn't help either. Unfortunately for the Confederacy, Missouri's natural and man-made supply and communication network could only help Union armies and the many fortified strongpoints constructed by the Federals could not be taken by the South's mobile but equipment starved and logistically poor upper Trans-Mississippi theater forces. Review: "One Damn Blunder from Beginning to End"
In March of 1864 Union forces led by Major General Nathaniel Banks launched a massive three-pronged land and riverine assault up Louisiana’s Red River valley that eventually included over 40,000 soldiers and 60 vessels. The capture of Shreveport, the capital of Confederate Louisiana and a major supply and logistics center in the Trans-Mississippi theater, was the operation’s main military objective. Economic and political goals included the confiscation of vast amounts of cotton for starving Eastern mills and the further establishment of a Federally-controlled state government in Louisiana and perhaps East Texas as well. Partisan politics, greed, and infighting doomed the campaign seemingly from the start and the result was a complete disaster. Historian and cartographer Gary Joiner’s One Damn Blunder From Beginning to End provides the reader with a concise narrative history of this important but often overlooked campaign. Since the publication in 1958 of Ludwell Johnson’s classic Politics and Cotton, several modern campaign histories of similar breadth of scope have been written. None are exhaustive, but what sets Joiner’s work apart is his mastery of the area’s geography. The author is at his best when describing and analyzing the peculiarities of the Red River and its tributaries along with their crucial impact on the operations of Admiral Porter’s Union fleet. Where the book falls flat is in the descriptions of the land battles, particularly the showcase battles of Mansfield and Pleasant Hill. Although a general understanding of the fighting is enhanced by the book’s inclusion of plentiful maps drawn by the author, the battle accounts are a bit too brief even for an overview. Another way in which One Damn Blunder improves upon previous overview histories of the campaign is in its use of recently uncovered information, which is spread liberally throughout the book. As examples, the means applied by Confederate engineers to temporarily divert the flow of the Red River in case of attack are fascinating and the author provides a rare in-depth look at the military defenses of Shreveport. Though conventional, Joiner’s analysis of the campaign is logical and covers all of the important points. The author casts an equally critical eye towards all levels of leadership on both sides. The result is a well-balanced account that avoids assigning all the blame for the defeat to the popular villain, General Banks. As is clearly illustrated in the book, the direction of the Union effort in the campaign from Lincoln on down was a credit to no one. On the other side, Confederate department head Edmund Kirby Smith made several crucial blunders that limited the extent of the overall Southern victory. In the end, Richard Taylor and Union engineer Joseph Bailey are perhaps the only major players who exit the campaign with their reputations enhanced. Although students of the Red River Campaign will be familiar with author Gary Joiner’s interpretation of events, enough new (or rarely known) information is provided that enhances our understanding of this important 1864 operation. The same cannot be said for many of the campaign overviews published today. One Damn Blunder is highly recommended reading for anyone interested in the Trans-Mississippi theater and 1864 campaigns in general. Did anyone else watch this History Channel program that aired on Friday (I know Mike mentioned it on his blog)? It bothers me that they took archaeological evidence that seemed rather inconclusive to me (a ratio of a sample of fired vs. dropped small arms ammo found in the Duncan and Sarah Bell fields) and so confidently attempted a major historical revision of what happened around the Hornet's Nest area. Additionally, if I recall correctly, they neglected to provide an alternative overall day 1 scenario that they feel would better fit the new theory. Stacy Allen obviously knows a lot about the battle but I would have loved to hear both Sword's and Daniel's opinion about this new evidence (or for that matter what poor Randal Gibson would think of it if he was still around). The shell skipping theory espoused by Gary Joiner was interesting. Joiner believes it was probable that the gunboats Lexington and Tyler fired up Dill Branch using the slope to ricochet 10 to 15-second fused shells into the air and over a wide area of the battlefield. It was unclear to me if Joiner came up with this theory himself or read about it through the accounts of actual participants. Continuing on with the Florida theme from a couple of entries ago, in my opinion, the best single volume dealing with the Civil War period in the state is William N. Nulty's Confederate Florida : The Road to Olustee (1994: Univ. of Alabama Press). While the heart of the book is an excellent and detailed battle study of the Confederate victory at Olustee (aka Ocean Pond), military history is only a part of what makes Nulty's scholarship useful. Confederate Florida is also a well-researched general overview of the state's entry and service in the Confederacy, especially its vital role in keeping the Southern field armies supplied with beef. For those readers more interested in Florida's Gulf Coast, George Buker's Blockaders, Refugees, and Contrabands : Civil War on Florida's Gulf Coast, 1861-1865 isn't definitive but is nevertheless a good place to start due to the broad range of subjects introduced. Just click on the Civil War History link for access to each book's webpage. Brett Schulte, who is looking for regimentals at the moment, might be interested in the first three titles listed (although I can't personally vouch for their quality). I am a bit intrigued by Jack May's War. Another "Swamp Fox of the Confederacy"
If you are a successful guerrilla leader near some soggy ground, there's a good chance you'll be awarded the coveted nom de guerre 'Swamp Fox'. For me, M. Jeff Thompson is the Swamp Fox of the Confederacy, but J.J. Dickison's operations in Florida apparently earned him a similar degree of notoriety. 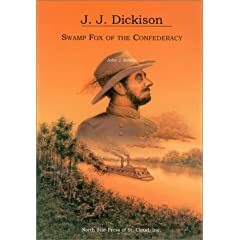 John J. Koblas's J.J. Dickison: Swamp Fox of the Confederacy is a highly laudatory account of Capt. Dickison's operations. Cheesy cover art aside, the book is a serious study that sports an impressive bibliography, although I have mixed feelings about how well he used his wide assemblage of sources. Additionally, for such an experienced writer, Koblas's historial narrative skills are a bit unpolished. His method of integrating first person accounts into his own narrative of events is often ponderous and repetitive. The first half of the book is surprisingly passive on the wartime role of Dickison and is more of a general history of the war in north Florida up to 1864. However, the action picks up during the last two years of the war and we are treated to a retelling of Dickison's exploits at Palatka, Gainesville, Marianna, Braddock's Farm, and his celebrated capture of the U.S.S. Columbine (a wooden sidewheel steamer rather than the city-class ironclad depicted on the cover). There is also an account of the Battle of Natural Bridge near the end of the book. Although the author probably isn't sufficiently skeptical of the claims made by pro-Southern officers and civilians as to the true extent of Dickison's military victories, the detailed examination here of these rarely explored events is very much welcomed. Dickison, who went on to write the Florida volume of the Confederate Military History series edited by Clement A. Evans, is a Civil War figure worthy of note, and Koblas's book, despite its flaws, is worth a look if you are interested in Florida's Civil War experience.